There are many fun and affordable fitness options in the Tysons area even right here at Towers Crescent. Don’t sit in traffic at the end of the day. Get a work out in and drive home on an open road. Get home safely, timely, and without the traffic headache by trying out one of the numerous fitness choices Tysons has to offer. N2Shape is located right in building 8000 at Towers Crescent and provides options for all fitness types. N2Shape offers personal training sessions, one on one, with a partner, or with a group, as well as exercise and training classes including spinning, roof top yoga, boxing, Zumba, Pilates, and more! 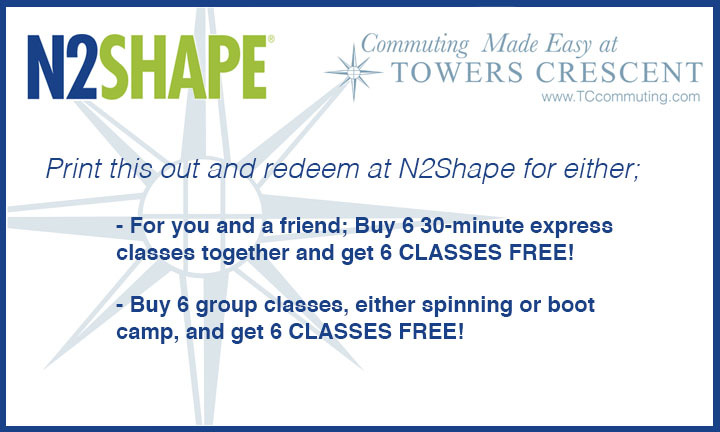 N2Shape is also offering this great promotion through Towers Crescent Commuting. For you and a friend; Buy 6 30-minute express classes together and get 6 CLASSES FREE! Buy 6 group classes, either spinning or boot camp, and get 6 CLASSES FREE! Don’t miss out on this awesome opportunity! !